From one of the experts in the field of archival photo storage, Nielsen Bainbridge has introduced a small but unique line of albums for the care of your precious photos. The Bookbound Photo Album is available in a variety of colors to match your home’s décor. Each album holds up to 160, 4" × 6" photos in archival flex pages that are acid-free, lignin-free, and PVC-free. 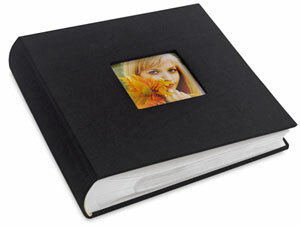 The pages are also designed to hold 5" × 7" photos, or a combination of 4" × 6" and 5" × 7" — you choose! The front cover features a cut-out for displaying a favorite photo. Library-style bookbinding holds the flex pages in place, which have ample room for journaling. A CD storage pocket is located on the inside back cover.